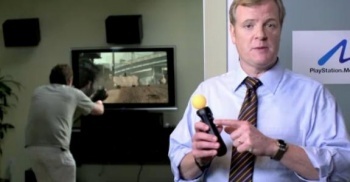 Bridgestone remains confident that no one was confused by the man behind Kevin Butler playing Wii Sports. Bridgestone's tire promotion hit a snag when Sony barged in demanding its Kevin Butler back. Actor Jerry Lambert and Bridgestone were jointly sued for their role in what Sony's describing as a breach of contract "and tortious interference with a contractual relationship." Except that Bridgestone - predictably, you may argue - doesn't see it that way. It denies that Sony has any proprietary interest in Kevin Butler, but in any event it doesn't matter because Lambert, not Butler, appeared in the Bridgestone ad. "Bridgestone denies that 'Kevin Butler' appears in the Bridgestone commercial discussed herein," said the tire manufacturer in a statement published by the Hollywood Reporter, "and thus denies that he speaks or does anything whatsoever in the commercial." Bridgestone also argues that Sony never registered any trademark on the Kevin Butler persona and that customers wouldn't be confused by Lambert's appearance in a Bridgestone commercial. A lack of a registered trademark - assuming Bridgestone's allegation is correct - may explain why Sony opted to take action under the Lanham Act. Subchapter III Section 41(a) of that act is all about what to do if an unregistered trademark is infringed, and it set guidelines for the likelihood infringement causing brand-harming confusion. The two most important factors in likelihood of confusion cases are similarity in overall impression created by the two marks, and the similarity of the goods and services involved. So while Bridgestone tires being in the tire business wouldn't normally have a leg to stand on, the promotion of a rival console to Sony's PS3 is what makes this a sticky legal mire.